This Twins Headguard has additional padding in the chin and cheek areas; it allows for a reasonable range-of-vision while still offering a high degree of protection. It is designed for full contact sparring. It holds up to the punishment dished out by world-class fighters. The firm, high-density foam padding and greater face coverage increase safety and improve the balance between comfort and shock absorption. 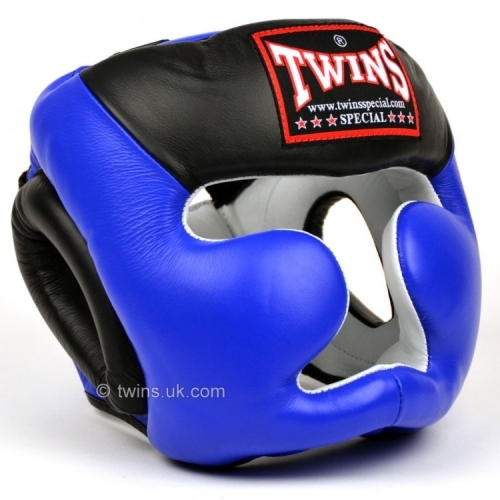 All Twins products are made from the highest quality materials; and will give you the performance and long-lasting strength you would expect from the company that set the standard in the world of the Fighting Arts. The craftsmanship and functionality of the Twins Headguard is unmatched. Regardless of your field of training; Muay Thai, western boxing, MMA, or personal self-defense you will not find finer quality leather Headgear anywhere. Twins is known for an unparallel level of variety and aesthetic creativity. All of our Headgear are made from one-hundred percent leather and top-of-the-line high density padding.